While we saw plenty of big performances on the defensive side of the ball on Sunday, that doesn’t mean to say that we didn’t get some big showings on the offensive side of the ball too. Let’s take a look at the Sunday Standouts on offense from Week 13. 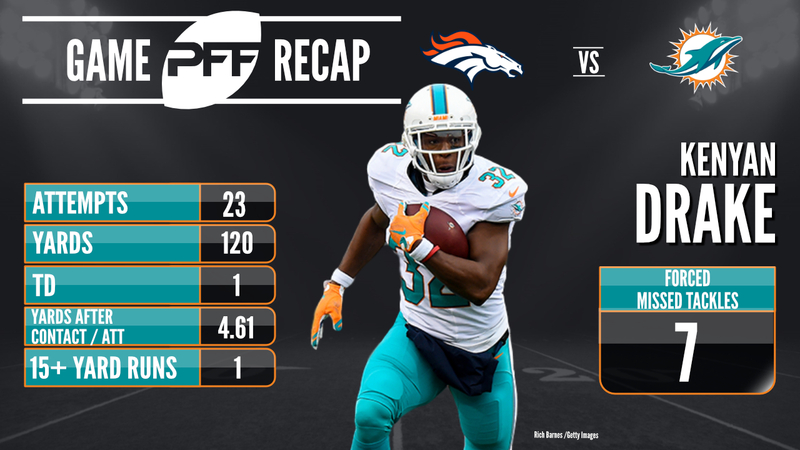 After trading away Jay Ajayi earlier this season, the Miami Dolphins need to find out if running back Kenyan Drake can be the man to build their rushing attack around. Based on his performance yesterday, they definitely can. Drake saw 26 touches on offense, and forced seven missed tackles as a runner, and two as a receiver, good for a 159.5 elusive rating. The New York Jets added more misery to the Kansas City Chiefs by inflicting another defeat on them, and the play of wide receiver Jermaine Kearse in particular was key. Kearse averaged 4.03 yards per route run, with 157 yards from 39 snaps in route, which currently ranks third among all wide receivers this week. Highlighted by his ridiculous one-handed catch, New York Giants tight end Evan Engram had the best game of his young career yesterday. On the field for 37 passing plays, Engram racked up 99 yards, good for a 2.68 yards per route run average. Fast becoming one of quarterback Philip Rivers top targets, Los Angeles Chargers tight end Hunter Henry impressed again yesterday. Showing off a safe pair of hands, he once again didn’t drop a single pass from the six catchable balls thrown his way, giving him a perfect 0.00 drop rate. Henry has now dropped just three of the 40 catchable passes thrown his way so far this season. 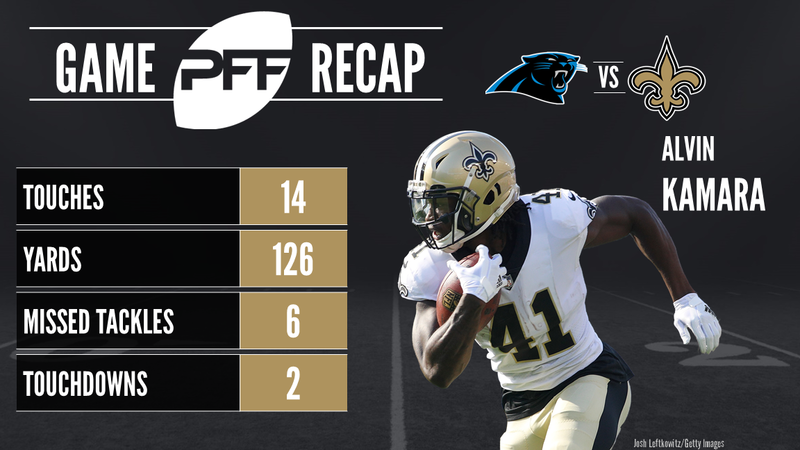 Another big performance from rookie running back Alvin Kamara helped the New Orleans Saints to another key win, and at this point in the season Kamara is proving to be the toughest player in the NFL to tackle. On just nine rushing attempts, he forced five missed tackles, adding another one on five receptions, giving him a 261.5 elusive rating. The Baltimore Ravens reeled off their third straight win to increase their playoff chances, and once again the performance of running back Alex Collins was key. Collins saw 15 carries on the day, forcing five missed tackles and averaging 4.4 yards after contact per carry, giving him an elusive rating of 129.4. 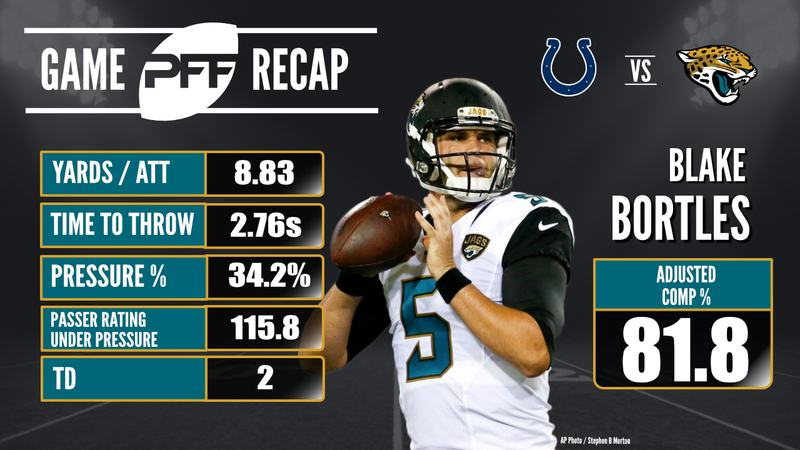 So far this season it has been enough for the Jacksonville Jaguars for quarterback Blake Bortles to just not make too many mistakes, but he stepped up and delivered one of the best performances of his career on Sunday. Going 26-for-35, Bortles saw two of his incompletions come via a throwaway and one play where he was hit as thrown. That resulted in an 81.8 adjusted completion percentage on the day. The Jimmy Garoppolo era is officially underway for the San Francisco 49ers, and he found some big plays off of play action in the win over the Chicago Bears. On plays using play action, he went 8-for-8 for 105 yards, good for an NFL passer rating of 118.8. The Tennesse Titans continued their winning ways on Sunday, and once again tight end Delanie Walker impressed on offense. Walker averaged 3.00 yards per route run, with 63 yards from 21 snaps as a receiver, and quarterback Marcus Mariota had a perfect 158.3 passer rating when throwing to him. Keeping his new quarterback clean was always going to be key for Joe Staley this week, and that’s exactly what he did. From 40 pass blocking snaps in the win over the Bears, Staley did not allow a single sack, hit or hurry, giving him a 100.0 pass blocking efficiency rating.